Home to the beautiful Khone Papeng Falls (largest in southeast Asia), ornate temples, while being the “World’s Most Bombed Country” from the Vietnam War, the Lao People’s Democratic Republic has endured a long history of hardships. Like most countries in Southeast Asia, Laos has been a target for colonialism from France, as well as Japan. Laos gained independence as a constitutional monarchy in 1953 from the French but with the impact of Vietnam War, they faced their own arduous civil war (1953-1975) that resulted in the establishment of a communist government in 1975. Currently, Laos struggles to develop as a nation, however it does not stop their people from being known for their honesty and simplicity, often attributed to their Buddhist roots. A large part of Lao culture is derived from the influences of Theravada Buddhism. Even with the invasions from foreign nations, Laos was able to maintain their Buddhist religious culture from the eighth century. Buddhism is a vital part of the people in Laos. Every village has a Wat (temple) where the people worship daily in the morning and the evening. The most revered Buddhist stupa is thought to be established since the third century, the Pha That Luang is covered in gold, and shines bright in their capital city of Vientiane. Although Buddhist influences dictate an important part of Laotian culture, there are influences far before the establishment of Buddhism. Music and food have been two consistent aspects of Laotian culture that have prehistoric origins. The khene is their national instrument created from bamboo pipes which is traditionally used to play folk music. The khene has uniquely Lao origins and is still used in ritual ceremonies and festivals to courting women. Stick rice is another staple of prehistoric Lao traditions which has more meaning to their culture than one may think. They consume the most sticky-rice per person than any other country in the world. Yet, it is more than a tasty part of their everyday meals. They see it as a vital part of their culture, some groups of Laotian people plant a unique khao kam rice near their home in reverence to their dead parents or they will plant it on the edge of their rice fields to indicate that their parents are still alive. Throughout their history of annexation and occupation, they are still able to maintain their culture and thrive in their agricultural industry. Eighty-percent of their exports is surprisingly not rice! Laos is especially known in the southeast Asian region for their coffee production. They have ambitions to expand their market in beer production and have started creating a buzz around the world. Laos still encounters many challenges as any other developing country but being able to preserve their culture over the past thousand years has been a remarkable accomplishment for a country that has been constantly exposed to foreign influences. To learn more about Laos, attend Go Eat Give Destination Laos on March 19, 2016 at Pattaya Cafe in Atlanta, GA. Click here to learn more. Atlanta foodies, we’ve got something for you! Your chance at an inexpensive culinary tour around metro Atlanta has finally arrived with the release of the Atlanta DiningOut Passbook. This tiny book of two-for-one entrée deals features over 50 of Atlanta’s favorite eateries and over $1500 in value. Participating restaurants include Agave, STK, Apres Diem, Anis, Murphy’s, No Mas Cantina, McCray’s, Sun In My Belly, Meehan’s, Einstein’s, and dozens more! In addition to eating good, purchasing the passbook also benefits the non-profit Open Hands Atlanta. Look at you, you philanthropist foodie! Enjoy the Atlanta DiningOut Passbook for only $39.99, regularly $99 with special discount code GOEATGIVEPASS2015. What’s more? DiningOut will donate another $10 to your favorite charity, Go Eat Give. That’s a win-win for everyone. So start saving, eat well, and give back along the way! Meet Amanda Villa Lobos, a 26 years old energetic and passionate lady currently volunteering at Go Eat Give. I’ve had the pleasure of interacting with her for the last few weeks as we worked side by side on Destination Brazil. Since our initial encounter, I have been drawn to her perceptions of the world, largely because it’s very evident that she has travelled vastly. The experiences she has picked up along the way make her a wholesome individual. She tells me a little bit about Brazil and the memories she has of her beloved home country. I was born in Rio de Janeiro in 1988, and thereafter my family moved to Brasilia, the capital of Brazil. Most of my time in Brazil was spent there. My parents are diplomats so I lived in many countries across the world. However, I spent a total of about 8 years in Brazil, traveling back and forth. What is your fondest memory about Brazil? My favorite childhood memory is climbing mango trees and snacking on juicy yellow mangoes. I enjoyed that so much. I would look forward to the weekends just so I could climb mango trees. I would be the only one climbing, and I think it’s my love for nature that prompted me to do so. Despite living in Brasilia, I was very much in touch with nature. I remember making teas with different herbs that I picked up, and making juices out of fresh fruit that I would find. You’ve travelled vastly around the world. What do you think sets Brazil apart from other countries? The people! Brazilian people are very hospitable. They invite you to their homes and share their personal space with ease. Sharing a meal, amidst laughter and great music, with friends and family is the order of the day. The relations amongst people are deeper and there’s a deeper sense of belonging. Everybody is welcoming and friendly. What’s your favourite Brazilian food? Meat tastes way better in Brazil because the livestock is grass-fed. Brazil is a huge country and every region has something special to offer. Our food is also highly influenced by different cultures from Europe, Africa, Middle East, and Asia, because we are a nation of diversity. This is evident in the huge variety of food that we have. For example, while making Feijoada, a Portuguese black bean stew, the locals would mix the beans with water/broth with some pork ribs. But the best Feijoada was made by the African slaves, because they added the ears and tails, typically parts of the pig that were thrown away, to the stew that made it a richer, thicker sauce. Today this is one of the most popular dishes in Brazil that gets friends and family together over the weekends. Coxhinia is my favourite pastry. It’s a little piece of dough that fits perfectly in your mouth, and it’s stuffed with chicken and cheese. It’s crunchy on the outside and moist on the inside. It literally melts in your mouth. Cuscuz Paulista could also easily be one of my favourite dishes. It’s made out of different flours and delicately finished in the shape of a round cake. It has tomatoes, green peas and shrimps around it, and looks like a beautiful cake. I miss the beaches. If I could wake up every day in Rio, looking at the sand and beautiful water with the waves breaking, then I would be the happiest person alive. There’s nothing more healing than being close to water for me. And people who live by the ocean are so peaceful, especially in the mornings, because they pass by the ocean before work and this gives them energy and Zen to face the day. Sadly, most children we sponsor do not even have a comfortable bed to sleep in – but that has already started to change thanks to new donations for mattresses. One of the things that is shockingly apparent when we visit families of sponsored children is their poor sleeping conditions. 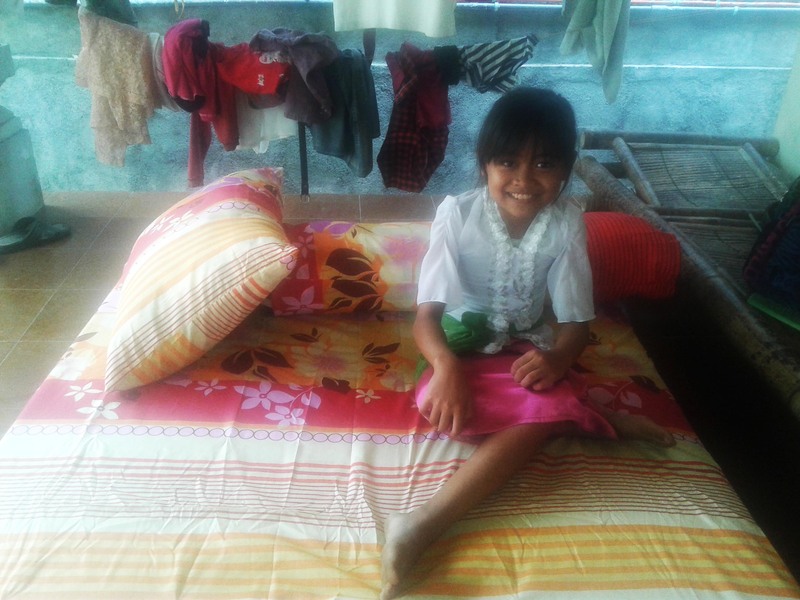 We’ve teamed up with Go Eat Give to donate 8 new mattresses to needy families in Bali. When Go Eat Give visited us recently, they asked us what they could do to help give immediate comfort to the children we help. Of course, mattresses was right at the top of our priority list. With all sponsorship funds going to support children’s education, it is sometimes difficult to provide things that we know families need – such as mattresses. It’s a sad fact that the majority of children we sponsor don’t even have a suitable bed to sleep on. The families that were previously struggling with school fees simply don’t have the disposable income to afford mattresses. Mattresses are often old, falling apart or simply thin sheets that are extremely uncomfortable. A complete set of good quality mattresses, pillows and sheets can cost over $120 – more than most families make in a single month. It really puts it into perspective how much need there is for decent quality beds. Go Eat Give supporters clubbed together to raise $1,000 USD – which enabled us to buy 8 top quality mattresses for the most needy families on our sponsorship program. Meanwhile, Tsarina, who recently sponsored Novianti had also asked if she could donate a new mattress to Novianti’s family. Tsarina had been to visit Novianti with our staff and had seen their sleeping conditions first hand. Our team had the pleasurable job of purchasing and delivering fully equipped mattresses to the delighted families. We were greeted with huge beaming smiles of families that were so grateful to finally have something comfortable to sleep on. The children were especially excited with the rare gift. The families of gone from only dreaming of new mattresses, to actually having them. We are so pleased to be able to provide additional support for families of sponsored children. But we can only do it thanks to the support of kind donors. Soon we will be launching our Mattress Appeal, which aims to secure many more mattresses for the children we sponsor. Please stay tuned! If you would like to donate a mattress, please consider giving $120, which will purchase a new mattress, pillows and sheets for a child. We will provide full receipts and photographs of where and who your mattress has been donated to. Remember to mark your donation ‘to purchase mattress’. You can donate here. ~ By Aron Hughes at Bali Children’s Project (BCP). Aron is from UK and currently living in Bali, Indonesia, where he does marketing and public relations for BCP. On Sunday, September 13, 2015, Atlanta welcomed for its second consecutive year, Le Diner en Blanc, a 25-year-old Parisian tradition of an all white affair that has now taken its showcase of elegance and friendship international. Surpassing last year’s attendance at the inaugural event, which took place at the Millennium Gates Museum at Atlantic Station, the dinner caught the eyes of over 1700 guests and shut down Peachtree Street for a posh picnic taken above and beyond our imagination of a plaid throw and a woven basket. Le Diner en Blanc unites people from all walks of life each year in 60 cities across 25 countries. This year, Donae Burston and Cleveland Spears hosted the Atlanta event in partnership with Moët & Chandon. They delivered an exceptional evening of entertainment, camaraderie and celebration. Guests came dressed to impress in the finest white attire – gowns, suits, headdresses – you name it. Also suited for the event, Moët & Chandon featured Moet Ice Imperial packaged in all white and the only champagne of its kind to be served chilled. The location, unreleased until minutes before the event, nestled eloquently between the historic performing arts venue, The Fox Theatre and upscale Midtown hotel, The Georgian Terrace Hotel. Guests checked in at multiple locations across Atlanta to be shuttled to the top secret location upon its announcement. Atlantans brought tables, chairs, white linen and competitive decor along with homemade dishes to the outdoor party. Rebecca Kailer Downs sparked the evening with sensational tunes performed in French, truly setting the mood for an evening of Paris in Atlanta. The waving of white napkins from Ponce de Leon Avenue to 3rd Street signaled the commencement of dinner and concluded with attendees lighting over a thousand sparkers, illuminating Peachtree street. Now, the real party has started. Ashanti Floyd, also known as The Mad Violinist, impressed many as he skillfully performed hit songs on the strings of his violin. Based out of Atlanta and Los Angeles, DJ Hands of Grace followed with a set of Top 40, House and R&B that couldn’t help but raise guests out of their seats and onto the dance floor. Le Diner en Blanc Atlanta was an unforgettable evening of great energy, class and pleasure. Check out the official website to stay up to date with next year’s locations and dates near you. You don’t want to miss out.